The FireWire Buccaneer provides a high degree of environmental sealing for FireWire connections using standard IEEE 1394a interfaces with data rates to 400Mbs. Dust & waterproof to IP68 the connector system is ideally suited to industrial or hostile environments where a digital high data rate combined with a robust and secure connection is required. Originally designed for office bound multimedia type equipment such as camcorders, computers, video cassette recorders and digital audio workstations it has found its way into scanners, web cams, external hard drives and external optical devices. But the ‘real-time’ ability for bi-directional, multi-speed data transfer on the same single network connection provides a truly universal connection for almost any consumer or commercial peripheral application. This flexibility has now moved from the home into industrial environments where hazards of water and dust are present. The new FireWire Buccaneer connectors meets this challenge. The screw coupling thread ensures a vibration and shock resistant connection, while sealing caps maintain the IP68 rating of the connectors when not in use. Cables are of over-moulded construction, available in 2m or 4m lengths as standard, they provide secure tamperproof connections between sealed and un-sealed 4 & 6 pole interfaces. Chassis mounted connectors are terminated with adaptor leads for connection onto PCB’s. Arcolectric has some 40 years experience in the design and manufacture of neon and filament indicators. Now, with mains rated LED’s becoming more commercially viable, the opportunity is here for this expansive range to use a technology that is inherently more reliable. The extensive range includes a great many options; snap and screw fixing to panel, mounting hole diameters from 5.8 to 14.0mm, bezels sizes from 6.7 to 18.3mm diameter, round and square lens shapes, protruding and low profiles, chrome bezels and pre-wired or 2.8, 4.8 and 6.3mm terminals. The ranges will carry internationally recognised approvals from Semko and UL laboratories. Arcolectric has recently expanded their portfolio of mains rated switches to include an extensive range of toggle switches. The 3900 Series of toggle switches offer a wide variety of switching options in single and double pole versions with SPST, SPDT, DPST & DPDT switching and momentary and three position actions. With mechanical life of 50,000 operations and full international approvals up to 16(4)A @ 250Vac, T85 (ENEC) and 20A @ 125/277Vdc (UL & CSA) the 3900 Series offer value for money with specification to match. The terminal options, 6.3mm tags or solder tags, make the switches suitable for both high and low volume manufacturing techniques. Nickel plated brass levers, with nickel plated nut and bush, fit industry standard 12.7mm diameter mounting holes and provide secure, durable operation. The range is complimented by a full range of accessories including; toggle seals, ON/OFF status plate and a special guard that prevents accidental operation of the switch. 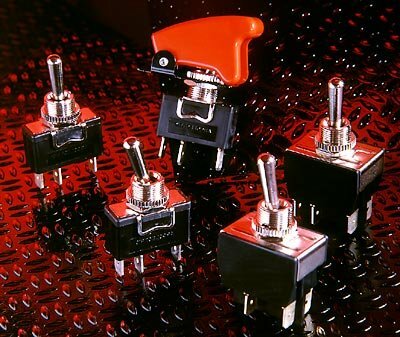 These switches find many applications where conventional lever operation is needed including; control panels, automation systems, test equipment, industrial equipment and even agricultural, marine and motoring accessories. 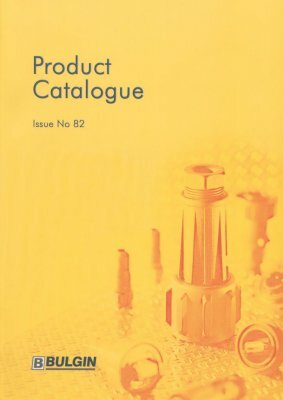 The latest Bulgin Components Product Catalogue, issue No 82, is now available and includes full specifications, drawings and photographs for all the current products. 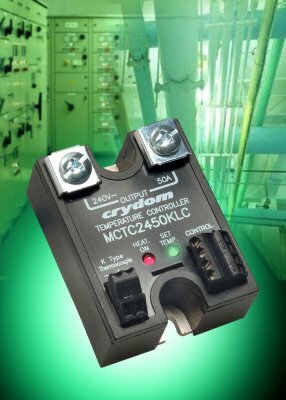 Crydom Launches New Temperature Control Solid State Relay. Crydom the leading manufacturer of Solid State Relays (SSR’s) has launched a completely new range of microcontroller based devices. The MCTC is a self contained temperature controller in a single industry standard panel mount package. The series combines all the necessary functions to accurately regulate temperature. With a simple set up procedure, they provide accurate control for designers for heater and cooling loads of up to 90A AC. 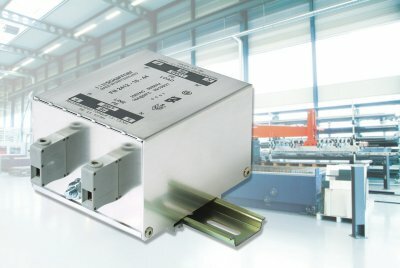 The MCTC requires a non-regulated low drive current DC source (10-32Vdc, 32mA max). The devices have an internally compensated thermocouple input, set to accept J or K types. Five available temperature ranges offering heating control over 37°C to 590°C and an inverse function for refrigeration down to –73°C. 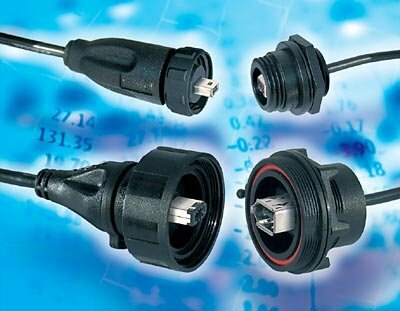 Setpoint adjustment is achieved by either low voltage dc or 4-20mA inputs. There is also separate enable/disable input to switch the load. Integrated zerocross burst firing and proportional derivative control avoids setpoint overshoot. Operators can easily see the controller’s status with separate LED indication for setpoint condition and output status. Load voltage switching can be either 280Vac or 480Vac suitable for both single and three phase systems. Connections are simple screw connections both control and load side. The industry standard package makes it suitable for Crydom’s range of heatsinks. Schaffner Ltd the market leader in EMC components and systems announce the introduction of the FN 2412 series of DIN Rail mounting EMC Filters. This new family of high performance single-phase filters are will fit industry standard TS 35 DIN rails and offer a simple to use, time saving, cost effective solution to conducted EMC suppression for panel builders and control cabinet manufacturers. The extensive range of current and voltage ranges available mean that even special applications can now be protected with an off the shelf solution. A sophisticated mounting system provides a simple and time saving snap-in mounting of the filters onto TS 35 DIN rails. The innovative shaping of the DIN-rail mounting bracket as well as its material guarantee low-impedance connection to the HF ground ensuring an optimal (asymmetric) filter effect, which has previously only been available by using traditional bolt-down chassis mounting methods. The FN 2412 filters have been designed, electrically and mechanically, to meet the requirements of industrial equipment and control cabinets. With models available off the shelf for rated currents from 8 to 45 A the correct FN 2412 EMC filter will typically ensure system conformity to Class A limits for Industrial and Residential environments. Owing to the high saturation resistance, this high attenuation performance is available even with very aggressive noise sources and under full load. 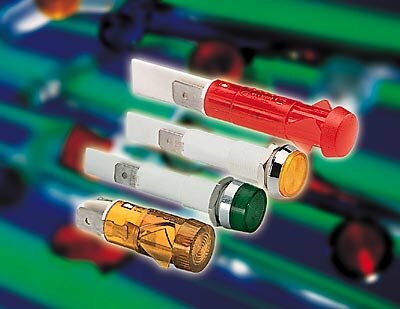 Schaffner’s specially designed “Touch-Safe” connection terminals make accidental touching of live conductors impossible ensuring maximum safety when in use. These new filters are designed for a maximum continuous operating voltage of 250 VAC and there is also a standard version FN 2412H available for higher operating voltages up to 520 VAC. All models are safety agency approved to UL, CSA and ENEC and are RoHS compliant. The FN 2412 range of EMC filters are also available in chassis mounting form for applications where Din Rail mounting is not possible. Designated FN 2410 these noise suppression components are available for the same voltage ranges (250 VAC and 520 VAC) and for an extended current range up to 100 A.